Motorcycle drivers have as many rights as other types of drivers out on the road, but should be treated with greater care as individuals riding are more exposed, and thus more likely to suffer injuries if involved in an accident. If you’ve been in a car-motorcycle collision in Miami, we can help. With over 100 years of cumulative experience as attorneys handling motorcycle accidents in Florida, we are well-versed in every aspect of the law and are skilled in pursuing cases similar to yours. 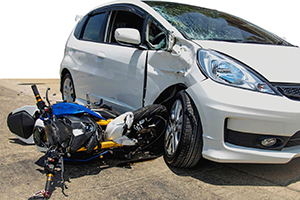 Motorcycle accidents can be more severe than those where only cars are involved because the individual driving the motorcycle does not have a large car surrounding him or her for protection. Florida law mandates that all motorcycle drivers have a motorcycle license and that individuals under 21 wear a helmet at all times. We recommend you wear a helmet regardless of age if you are driving a motorcycle. If you’ve been in an accident, you should first contact our team of attorneys, as they will guide you through the best way to proceed. Our team will go about collecting evidence for your claim. You should, if possible, record video and take pictures of the scene of the collision, ensure you speak with as many witnesses as you can, ask them for a written statement as to what they saw, and take down their contact information for later use. If possible, collect your motorcycle and do not disturb any damage that may have been caused to it, as this can be claimed as part of your recovery from the other party. If you or a loved one has been involved in a car-motorcycle collision in Miami, it’s prudent and ever pressing to contact an attorney today. Our team of experienced attorneys at Friedman, Rodman & Frank are prepared to fight for your right to compensation for the losses you’ve sustained to your person and property. We have been pursuing cases like yours for over 100 cumulative years, gathering more and more expertise and ways to tackle each and every claim. Give yourself the best chance at securing money for your injuries and losses by reaching out to us at 305-448-8585, or contact us online. We are ready to discuss your claim by setting up a free, confidential consultation in English, Spanish, or Creole. No attorney’s fees are paid until the successful conclusion of your case through settlement or verdict.